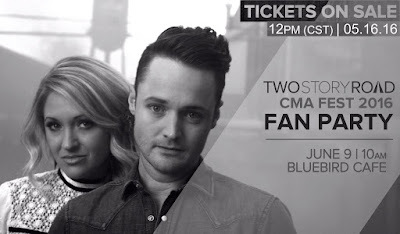 Two Story Road 2016 CMA Fest Fan Party Tickets On Sale Today! Tickets for this event are $10 and seating is EXTREMELY LIMITED! On Monday May 16th at 12pmCST, TSR will be posting a link on FB, Twitter, & Instagram that will enable the FIRST 80 PEOPLE to secure their spot.